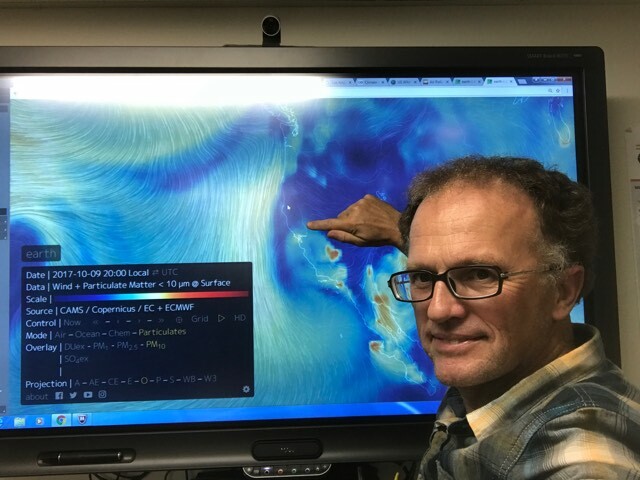 Were The California Wildfires Deliberately Set? Left image BEFORE: Particulates (PM10) in air at 2000 Local Time. Right image AFTER: Particulates (PM10) in air at 2100 Local time. Note that the particulates have all appeared in multiple locations within the space of 1 hour. This seems suspicious to me, assuming that the data is correct . 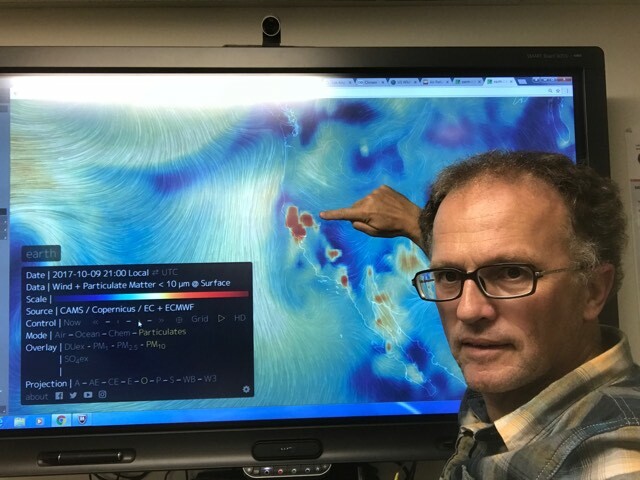 About a week before the California wildfires erupted, I wrote a post titled: ‘Climate Change Magnified MegaFires‘ with a video called Amplification of MegaFires from Climate Change‘. In this video I discuss horrendous and ongoing California fires. These wildfires have killed multiple people (100s are still missing) and destroyed thousands of buildings. In examining Earth Nullschool data on air particulates, it seems that the fires appeared in multiple locations within the space of one hour. This seems suspicious, if the data is accurate. A few hours after the uploading of my video to YouTube and this blog post, this link ‘PG&E power lines linked to wine country fires’ (article in full, at link, a selection), to a possible fire cause was posted to my Facebook pages. Perhaps power lines were knocked over in multiple places igniting the fires? 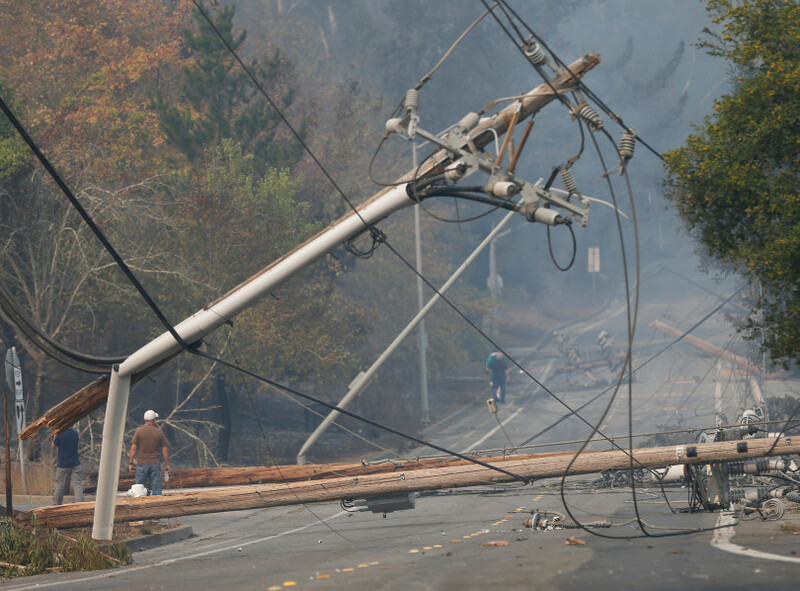 ‘As the first reports came in Sunday night of numerous fires that would grow into one of the most destructive wildfire disasters in California history, emergency dispatchers in Sonoma County received multiple calls of power lines falling down and electrical transformers exploding. ‘In all, according to a review of emergency radio traffic by the Bay Area News Group, Sonoma County dispatchers sent out fire crews to at least 10 different locations across the county over a 90-minute period starting at 9:22 pm to respond to 911 calls and other reports of sparking wires and problems with the county’s electrical system amid high winds‘.
. Please note: Earth Nullschool has the fire starting between 2017-10-09 20:00 and 2017-10-09 21:00. Published reports say the fire started Sunday night which would be 2017-10-08, so I think the Nullschool date is wrong (and is a day behind)? This entry was posted in Basic Science, Catastrophe, Collapse, Global Warming, New Video, News, Rapid Climate Change, Recently Published, Uncategorized, Warnings, Weather and tagged Abrupt Climate Change, Albedo, Antarctica, Arctic, Arctic Sea Ice, Arctic Temperature Amplification, Barbuda, Blue Ocean Event, Brush Fires, Burn Area, Burn Areas, Canopy Fires, Capitalism, Carbon Dioxide, Climate, Climate Casino, Climate Change, Climate Reanalyzer, Climate System, Crop Failure, Dessication, Dominica, Drought, Earth, ECMWF, Economics, Education, Feedback, Feedbacks, Fire, Fire Jumpers, Firefighters, Fires, First Year Ice, Florida, Frazil, GFS, GHG, GHGs, Global Warming, Greenhouse Gases, Ground Fires, Heat Waves, Hotshots, Hurricane Irma, Hydrology, Irma, Jet Streams, Learning, Maria, MegaFires, Methane, Multiyear Ice, Naomi Klein, Natural Disasters, Nullschool, Oceans, Paul Beckwith, Radiative Forcing, Science, Scientists, Slush, Smoke, Superstorm, Teaching, Thermocline, Tutorial, USA, Water Vapour, Waves, Weather, Weather Weirding, Weather Whiplashing, Weather Wilding, z Amplification of MegaFires from Climate Change, z Forests. Bookmark the permalink. 5 Responses to Were The California Wildfires Deliberately Set? Don’t know. There is scant info on this subject.